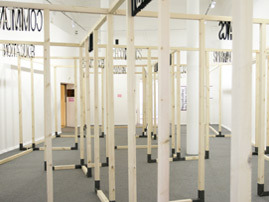 "In this exhibition Robinson worked with each of the other artists, assisting, collaborating, intervening and reframing. His works at Artist House took the form of curatorial placards, produced by his own art organisation, Centre for International Success’. Robinson produced five works for Leeds City Art Gallery that question the rhetoric of institutions and artists. 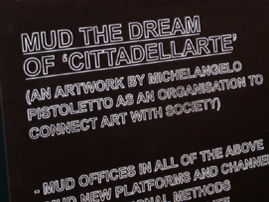 In his work ‘Mud Manifesto he riffs on Pistoletto's manifesto and Mud Factory, a sculpture by Charlie Jeffery, to call for a new Mud Office to be created. This was the founding moment of Mud Office who over the next few years Robinson and Jeffery established as an artistic production agency delivering project commissions in France for Rennes Biennial, Galerie Ho (Marseille), CAC-Synagogue du Delme, Palais de Tokyo (Paris) and La Station (Nice)."